During the late 1960s, throughout the 1970s, and into the 1980s, New York City poets and musicians played together, published each other, and inspired one another to create groundbreaking art. In "e;Do You Have a Band? "e;, Daniel Kane reads deeply across poetry and punk music to capture this compelling exchange and its challenge to the status of the visionary artist, the cultural capital o… f poetry, and the lines dividing sung lyric from page-bound poem.Kane reveals how the new sounds of proto-punk and punk music found their way into the poetry of the 1960s and 1970s downtown scene, enabling writers to develop fresh ideas for their own poetics and performance styles. Likewise, groups like The Fugs and the Velvet Underground drew on writers as varied as William Blake and Delmore Schwartz for their lyrics. 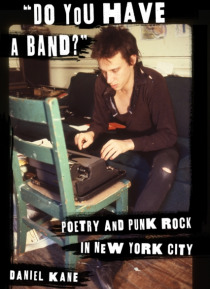 Drawing on a range of archival materials and oral interviews, Kane also shows how and why punk musicians drew on and resisted French Symbolist writing, the vatic resonance of the Beat chant, and, most surprisingly and complexly, the New York Schools of poetry. In bringing together the music and writing of Richard Hell, Patti Smith, and Jim Carroll with readings of poetry by Anne Waldman, Eileen Myles, Ted Berrigan, John Giorno, and Dennis Cooper, Kane provides a fascinating history of this crucial period in postwar American culture and the cultural life of New York City.